If you were able to manage the heat, Ciclavia was another edition in a long line of great events. 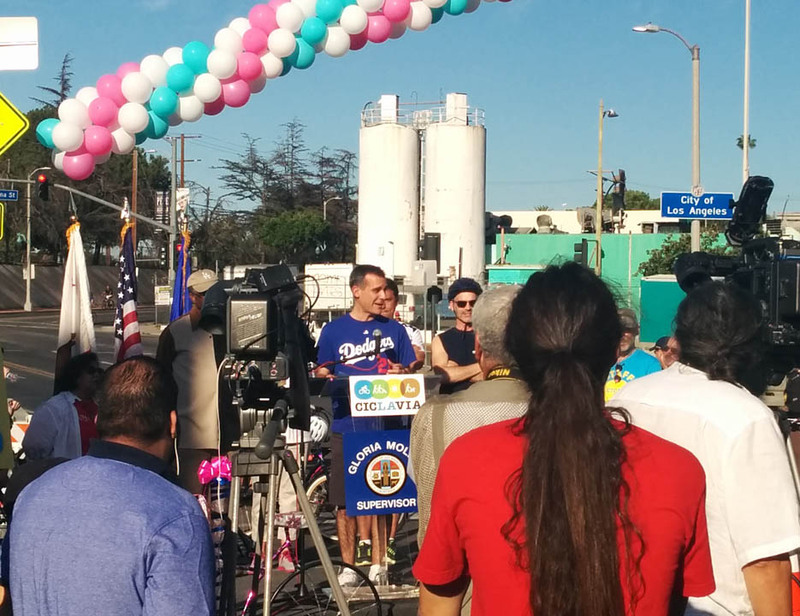 Before the official starting time, Mayor Eric Garcetti got things started technically in East LA city limits just across from the Cinco Puntos Memorial. Also on hand was Councilman Jose Huizar and County Supervisor Gloria Molina, who are running against each other for Huizar’s seat. Heading to the East LA hub, you found the wide assortment of tents and food trucks already set for the day. I started from this point right at 9am to beat the heat and the crowds. Initially, the streets were wide open, but it got crowded exponentially with every minute. By the time I got to Mariachi Plaza in Boyle Heights(only four miles), the event already was in full swing. Of course, there was a mariachi band, but traffic was so thick you had to dismount to pass. I continued on to the 4th Street Bridge where a regular phenomena continued. People for some reason like hanging out here. There really isn’t anything to do other than look down the river or see the panoramic view of downtown. onto the course. 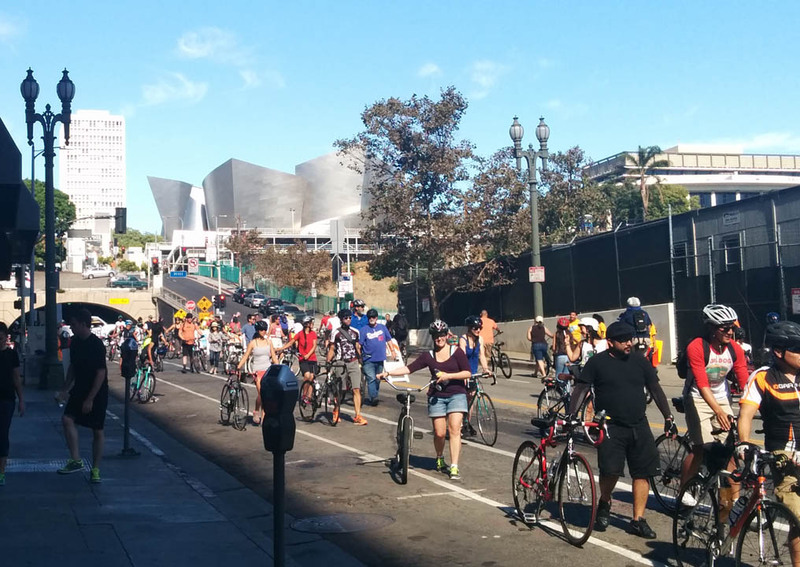 He didn’t seem to recognize that there were hundreds of bikes controlling the entire roadway and continued at normal speeds until someone stopped him. Crisis averted. Hitting Broadway, I had time to go to one of its spurs, so I continued south to the Theater District. I wish I could have gone into the Los Angeles Theater as they were giving free tours, but I marched on. Funny how most of the marquees had Jose Huizar’s name on them. I dashed back up and made my way through the 2nd Street Tunnel. It’s a favorite because of the echos that can be produced without being muffed out by cars. Back into daylight, it was nice to travel under the 1st Street Bridge without having to fight the regular traffic. It seemed to soon to be at the Echo Park hub. It already was at full capacity with every food truck filled with customers. I wished I had more time to spend, but it just makes me eager for the next. I’ll see you December 7th in South LA!